A supply of Pulp Fiction image keychains has been made available to us. And while the selection is limited to those 12 images shown below, quantity is high and quality is great! 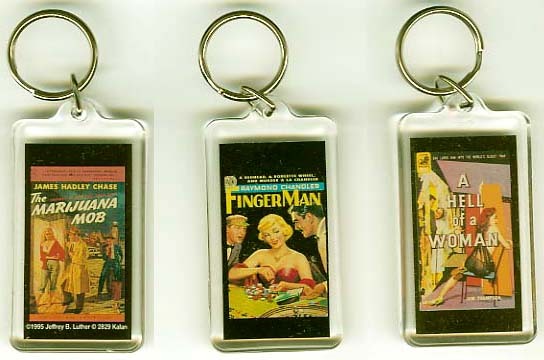 These full-color key chains are approximately 1.5" wide x 2.5" high, are laminated in clear plastic, come with a key ring, and display the image on both sides. Click here for an image of 3 of the actual keychains. Be the first on your block to have one (or more!) of these jewels rattling around in your pocket or purse! Retail Keychain Order Form - $3.95 ea. For Wholesale/Dealer sales and ordering information, visit our Wholesale/Dealer web page here to find "Wholesale Products Available from PC Design"
Dealer Inquiries for Keychains are welcome!